PARAQUITA BAY, Tortola, VI- Contestant number four Joi-Ann Nikia Thomas copped the prestigious title of Miss Junior BVI 2016/17, while Shermar Blijah Tylick Trim walked away as the first ever Mr Junior BVI at the Eileene L. Parsons Auditorium, H.L. Stoutt Community College in Paraquita Bay on Sunday July 10, 2016. Thomas copped awards for Miss Popularity, Miss Intellect, Miss Congeniality and Best Talent. First Runner up went to Dyese Turnbull, who received awards for Most Poised, Best Black and White Affair and Best Evening Wear. The Second Runner up went to Dje’Moyia Smith who took the Miss Photogenic Award. For the Best Swimwear award, there was a tie between Dyese Turnbull and Dje’moyia Smith, and as a result, the appropriate sashes will be given to both ladies at another date. Other Miss Junior BVI contestants were J’Lessa Smith and Kanya Matthew. Speaking to reporters following the crowning, Thomas, 21, a recent graduate of the HLSCC and an employee of the BVI Tourist Board, said she was not worried, particularly when the awards began pouring in. “I am very happy,” she remarked, adding that hard work definitely paid off particularly as she had to trade her cadet boots for a bright fuchsia and silver gown and heels, and learn to walk in them. Meanwhile, Shermar Blijah Tylick Trim, 22, made a sweep of the awards against the only other Mr Junior BVI contestant, Akeem Stanley, including Mr Popularity, Mr Intellect, Mr Congeniality, Most Poised, Mr Photogenic, Best Swimwear, Best Talent, Best Black and White Affair and Best Evening Wear. Trim said he felt “amazing” and on the other hand was not expecting a win. He said contrary to popular belief that men taking part in pageants are leaned towards the “gay” department, this is not so in his case, rather it is about knowing what you are about and going after it and in his case, the crown. The event was a production of the East End/Long Look Festival Committee. The pageant was judged in the introductory round, which carried a maximum of 10 points, Swim Wear had a maximum of 30 points, Black and White Affair carried 50 points, Talent totalled 90 points, Evening Wear 75 and Question and Answer carried a maximum of 60 points. how are you sure the money wasn't gained from local businesses? Thats not a dude crown. HIS should be simple and lower profile. The crown is too small for him anyway; it can't go down onto his head. So maybe they will replace it with different one. You guys forgot to mention Akeem, at least acknowledge him. 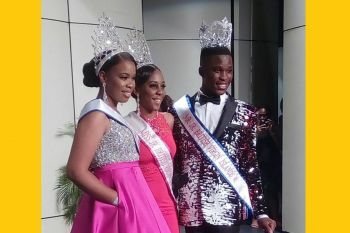 "Meanwhile, Shermar Blijah Tylick Trim, 22, made a sweep of the awards against the only other Mr Junior BVI contestant, AKEEM STANLEY"
THOSE CROWNS ARE TO BIG THEY LOOK STUPID IT IS TIME THE BVI GET AWAY FROM THOSE BIG UGLY CROWNS. The judging was based on popularity. What a waste of money. I agree 100%. Let's be honest. If this was an international pageant Contestant #1 would have won. This alone shows you how low the criteria is for winning these pageants. Then they expect to gain a title when these girls go abroad outside of the Caribbean? Come on! What a waste of money indeed! I should've known better- Miss East End Long Look has always been one of the lowest class of pageants in the BVI. Contestant Number #1, we must have attended two different shows! Her black and white was ehh, her talent was garbage, her dress didn't complement her and I am still waiting for a half decent answer.. May be you meant #3, I think she deserved to win. Number 3 really? Since when is twirling a talent. Any four year old can do that. She was a mess in that swim suit with the love handles galore (yuck). Don't get me started on the question, she did not even come close. Her gown was good but that was it. Literally that was all. Be thankful for small mercies and don't throw stones. Wait! Love handles is a yuck now?? No body shame boo boo sorry to this is s No no!! I am sure who ever you are, you don't even have shape!!! It's always the ppl that feel less about them selves is who does make comments like this!! Since you feel you look better and you body unloving run in a show!! So we could talk about how mess up you body look!! she a real young lady not effing plastic!! So this was the miss east end long look thing? Yes, Miss Jr. BVI is a replacement of Miss East End/Long Look. How much government paid on this show? Same thing I was saying. What they did to contestant #1 and to Akeem was unfair. It wasn't a judged competition it was a popularity show. Then they wonder why nobody wants to be contestants. Stanley did not deserve no prize stop going in pageants. Stanley need to pack bag at onemart that is his real talent, not pegeants, you are definitely not for that. All I see is females though.